Natural & Artificial Flavors, Sucralose, Citric Acid, Silicon Dioxide, Malic Acid, FD&C Blue #1. Take entire contents of this packet before intense training with 1/2 a cup (120 ml) of cold water. Ideal for use before intense physical activity. Stay adequately hydrated. NOTE: Highly concentrated. Never exceed 1 serving at one time. Not for use by individuals under the age of 18. Do not use if pregnant or nursing. Consult a healthcare professional prior to use if you have, or have a family history of, heart disease, diabetes, high blood pressure, depression or other psychiatric condition, glaucoma or seizure disorder, or if you are using a monoamine oxidase inhibitor (MAOI), lithium, any prescription drug, or any over-the-counter drug. Avoid other sources of caffeine during use. This product is not intended as a substitute for sleep. Keep out of reach of children and pets. Store in a cool dry place. Natural And Artificial Flavors, Sucralose, Citric Acid, Silicon Dioxide, Malic Acid, FD&C Blue #1. 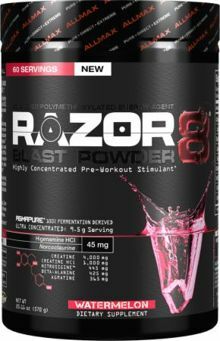 Take 1 serving (1 full scoop) before intense training with 4-6 oz of cold water. Ideal for use before intense physical activity. Stay adequately hydrated. NOTE: Highly concentrated. Never exceed 1 scoop at one time. Not for use by individuals under the age of 18. Do not sue if pregnant or nursing. Consult a health care professional prior to use if you have, or have a family history of heart disease, diabetes, high blood pressure, depression or other psychiatric condition, glaucoma, or seizure disorder, or if you are using a monoamine oxidase inhibitor (MAOI), lithium, any prescription drug, or any over-the-counter drug. Avoid other sources of caffeine during use. This product is not intended as a substitute for sleep. Keep out of reach of children and pets. Store in a cool dry place. ALLERGEN WARNING: Produced in a facility that also handles Milk, Soy, Egg, Peanuts, Tree Nut, Fish, Crustacean & Shellfish products. ALLERGEN WARNING: Produced in a facility that also handles Milk, Soy and Shellfish products.